The barons of media exclusion, that spread a confederacy of silence around Ron Paul, are descendants of the same cabal that sent Jefferson to France during the drafting and debating at the Constitutional Convention. These latest cohorts want to continue the same dominance over the spirit of the revolution. This eternal battle is presently waged under an invigorant new awakening. The old game no longer works. Swept away are their lies, because their pseudo propaganda all point to the oz cult behind the curtain, and the destructive reality of their plots are visible for all to see. Sadly, many Tea Party conservatives still accept the Neocon foreign policy deception. Ron Paul is a non-interventionist, not an isolationist. Watch the thinking man’s version of a strong leader in the video, Ron Paul Speaks Out: Media Blackout, Economic Freedom, Intellectual Revolution. Go beyond the sound bites and ads, then ask the hard questions. Once the presidential campaign heats up after Labor Day, the cast of characters will keep shucking out the phony common man populism, while cavorting with the same money interests, corporatists and banksters that select every other nominee. Have you forgotten the Skull and Bones ticket of 2004? Surely, the progressive McCain was no choice over the “bomber” Obama general. The entrenched GOP party facilitators want to marginalize Ron Paul as dangerous because he resists tribe orders and refuses to waste another generation of youth in the service of zealots. Liberty demands that our sons and daughters no longer be consumed as cannon fodder. Translate the “ON BEHALF OF A GRATEFUL NATION” sympathy statement to read – The defense department regrets to inform you that your sons are dead because they were stupid. Now even the disappointed left have figured out that warmonger Barry Soetoro AKA Barack Obama, is no different from George W. Bush. So when will the Republican faithful come to grips, that Bachmann and Cain are IRS and Federal Reserve cronies, respectively? SHOWING HIS BUSH CREDENTIALS: In the end, Obama merely expanded and finished the Bush Jr agenda. As for Romney, anyone who is willing to champion person status for corporations deserves to file chapter 7 on his own campaign aspirations. New World Order Perry is the puppet of choice. His rhetoric will ring home to many, because he lifts it directly from the Ron Paul journal. However, Rick Perry is the next incarnate plastic doll, which will read the script from the banksters’ ledger sheet, once elected. When was the last time you heard another Republican presidential candidate utter the words civil liberties? Or name another public figure that actually made his life’s work synonymous with LIBERTY? 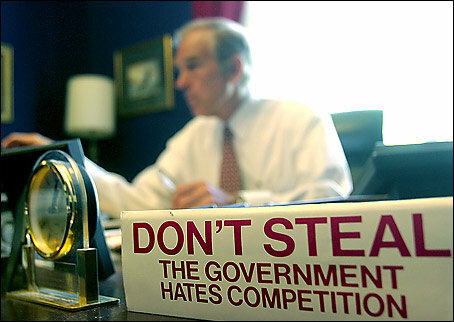 Only Ron Paul stands the test of performance. So how can Paul win in the GOP primaries? The New York Times offers a salient chart and states, “On the Republican side, partisan self-identification peaked in the early 1990s – as did the percent of the electorate voting in Republican primaries – before declining.” Decrying the GOP hacks, every liberty Republican patriot needs to organize their universe of friends and acquaintances to get the vote out at the ballot box on primary day. Just a minimum increase and return to the 33% 1990 levels with Ron Paul voters will result is his victory for the nomination. The caveat does require a verifiable monitoring of any enhanced electronic voting count against liberty-minded voters or the sabotage by the party of the delegate certification process. Presidents are selected well before the general election. Ron Paul will generate significant support and votes from independents. Even disgruntled Democrats will rally in a general election; however, the Republican registered primary voter must resist the perennial Neocon treachery. The frustration of discussing politics in an era of denial needs to be overcome. Enrolling a Republican voter into the cause of Liberty can be a daunting task. Those who believe that the party of Lincoln champions a proper conservative defense of liberty are wholly confused. Tea Party proponents must reject the GOP establishment and their – hijack express. Do not believe the hype. Accurate public Tea Party approval sentiment is not in decline. Simply, the only drink that Rick Perry partakes is an imported Camellia sinensis brew, while he worships another lord in the Bilderberg temple. Lastly, those critics of Ron Paul’s Austrian economics usually oppose a return to a resurrection of a modified gold standard. Yet if you dig deeper, those same detractors maintain an apologist attitude for keeping a central banking system. Few disparagers view the preservation of liberty on the same scale as their return from compound interest. The money elite may soon conduct another false flag to scare the uninformed and redirect one more staged diversion. The rush of enthusiasm for retaking our liberty is the essence of the Ron Paul message. The generation that tasted the joy in the establishment’s fear during the 1960’s appreciates just how a government can be broken, from conducting an exhausted and immoral war. Today everyone needs to learn this lesson, apply traditional conservative populist principles, and eliminate the central banking tyranny that is the prime destroyer of our economy. The fascist state that follows orders and reports to this private bank-ruling cartel is the foremost enemy. Is Liberty more important to you or do you think a looser fit of your governance chains is achievable with your continued apathy? This oldie but goodie YouTube tune is still relevant today. Break out the band and get your neighbor to join in and sing the lyrics. Most important – get out the Republican Ron Paul primary vote. This article first appeared at the BATR FORUM.